Lavish Sunday Brunch At Rs. 285 Only is an event that took place on 09-Jul-2006 in Hyderabad. ·Live Counter: Non veg and veg snacks such as Chicken Chettinad, Gobi Manchuria, Paneer Tikka, Paneer Jalfrezi etc. ·South Indian dishes such as dosas, uttapams, idlis. 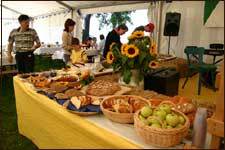 ·Continental breakfast foods such as corn-flakes, bread-rolls etc. ·Five non veg dishes with fish/chicken/mutton. ·Two soups (1 veg and 1 non veg). If that layout is not enough to tempt the dead, much-less the glutton in you, well we know who the true successor to  Kate Moss is now. Be the first to comment on Lavish Sunday Brunch At Rs. 285 Only! Just use the simple form below. fullhyd.com has 700,000+ monthly visits. Tell Hyderabad what you feel about Lavish Sunday Brunch At Rs. 285 Only!